This week I began some more intensive poetry study with my literature students. It’s spring; we’re all getting itchy to be done with school; the flowers are blooming, and gosh I’m in a poetry mood. Fortunately, my last-August self had the foresight to plan poetry for this time of year because I knew that would be the case. We started with an illustration of how we, being busy human beings, don’t notice beauty around us. 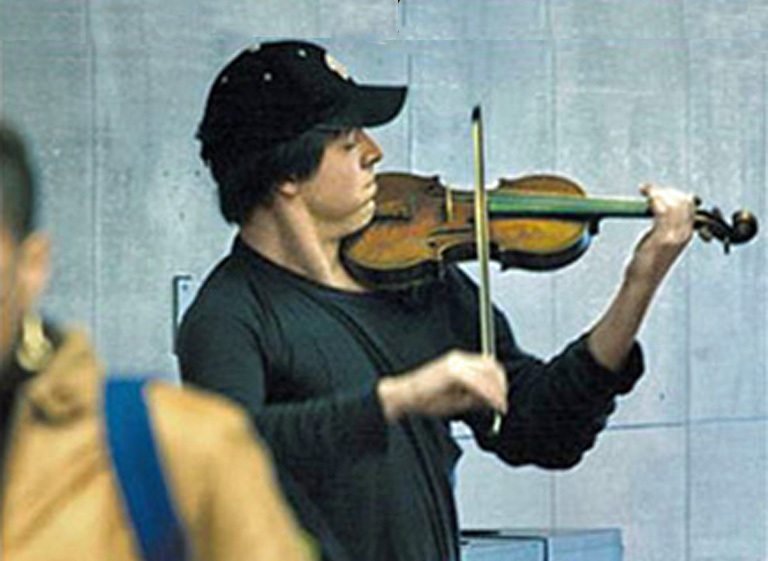 That’s the 2007 experiment conducted by The Washington Post wherein Joshua Bell, renowned concert violinist, took up residence — along with his $3.5 million Stradivarius — in a DC metro station. He played for close to an hour and made just shy of thirty-five dollars in tips. The answers were what you’d expect: I had an early meeting. I had to get him to daycare. I have two more stops before I get to work. People said exactly what I’d say if I were asked the same question. Later on, the authors of the experiment analysed the video from many perspectives. Who looked at Bell? Who dropped money in his case? Were there any similarities? Was there any group of people that stuck out? Ashamed, I will admit that I have been that parent too often. The lesson, of course, is one we know, but routinely ignore. We are too numbed by our frantic busy pace to recognize beauty. Even when it is loudly echoing around the chambers in our usual subway stop, even when our children are begging us to stop, we blaze through, hellbent on completing whatever task or errand we might see as essential at that time. The next train is pulling into the station. Who can afford to miss it? He raises his violin and summons its sound. The arias echo down the long tunneled halls. wrought in melodies that we had long forgotten. to drop a dollar in this old instrument’s case? Chris’ song, along with Ben Shive’s brilliant arrangement, takes you inside the subway station. You can hear the busy pace of the commuters bustling through the gates. You can hear the echo of the long underground chambers. You hear the arrival and departure of the trains. Above the fray is a lone violin — played by “the fiddler.” Will anyone stop to listen? or felt the raindrops falling might be calling you astray? all beckoning hope in a sermon of notes and rests. The fact that this had actually happened, with an award-winning violinist playing a multi-million-dollar violin, was the kicker. Once they got the hang of what was happening, my students correctly wagered that Mr. Bell earned little to nothing of his usual salary. Later that day my son asked me why the article is called “Pearls Before Breakfast.” I explained the play on Matthew 7:6, “Do not give dogs what is holy, and do not throw your pearls before pigs, lest they trample them underfoot and turn to attack you.” Jesus said this in reference to the Gospel, explaining that there will be some people who will reject the message so vehemently that they are probably best left alone. The Washington Post applies the phrase to all of us who would have passed that fiddler in the subway station. We are unworthy of a second listen, having rejected the first chance out of hand. And of course, the rejection happened…well, before breakfast. These days I am trying to perceive my real, beautiful God-given life as pearls, and the urgent, unimportant (usually internet-granted) interruptions as subway trains. Sometimes there are trains I have to get on, but I want to sit and listen in the station as long as I can. I don’t want to be looking over at every screaming train whistle. Not all of them need my attention. I want to be worthy of the pearls. How can I afford to miss them? P.S. You can purchase Chris’ wonderful EP The Mantis and the Moon here. Thank you, Kelly. I’ll be looking for pearls today. Holy Cow. EVERY kid tried to stop, and EVERY parent hurried them on. What a commentary on our world. Man, this is wonderful! Thanks for the reminder.